Those heroic Argonauts of Greek mythology took their name from their ship, the Argo. It’s also the name Ben Farver took for his own two-wheeled vessels – Argonaut custom bikes – when he first started making steel bikes in Portland back in 2007. We know what you’re thinking: "Steel bikes in Portland?" Isn’t that straight out of a "Portlandia" episode? You’re right. It’s certainly a saturated market, which is one of the reasons Ben shifted materials to carbon. Of course, the Argo itself was named after Argus, the ship’s builder, so those that ride Ben’s bikes should really be Farvernauts, and you can now count us among those happy Farvernauts. Ben’s shift to carbon had more to do with pragmatism than concerns about style. He wanted to bring something new to riders and at the same time wanted to ensure he could make a decent living. Both goals are tough in steel. But how exactly could a one-man builder bring something new to carbon? Plenty of builders are already doing custom carbon by buying tube-sets and essentially mimicking steel production with over-wrapped carbon replacing lugs and welding. Ben wanted the performance of monocoque carbon but he lacked the half-million dollars it can take to create a size run and he could say good-bye to custom dreams. It’s a tough nut to crack, but crack it Ben did. 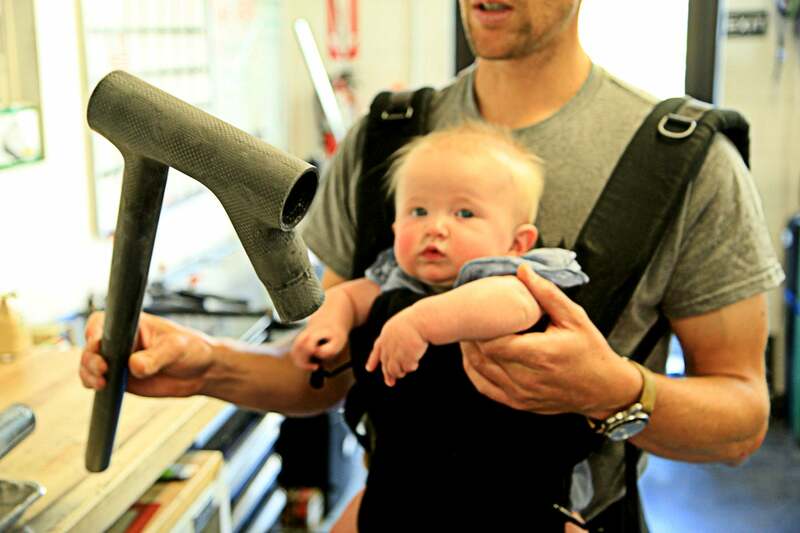 Thanks to a relationship with Innovative Composite Engineering, another Oregon company, Ben found a partner willing to do much more than sell him carbon tubes. Most carbon-services companies with serious know-how reserve it for big-money automotive or aerospace manufacturers, but the ICE guys are riders and were immediately intrigued by Ben’s idea—custom, monocoque bike frames made right in Oregon. RELATED: Check out the custom Emonda Trek just made for Alberto Contador. The solution Argonaut custom bikes hit on reverses the traditional bladder molding techniques used in cycling. Instead of laying carbon up in the mold itself, Argonauts are laid up over an internal, rigid bladder structure and then molded. This internal structure can be altered to allow for custom geometry. 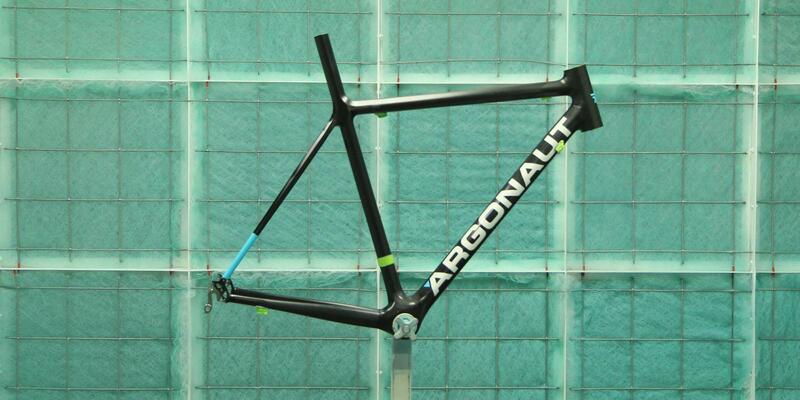 Each Argonaut is made from seven pieces—like the single bottom bracket-down-tube-seat-tube unit—and then assembled. Carbon allows Ben to go farther than simply offer riders whatever geometry or fit they want; every one of those sections features layup customized for the individual rider. It is this process that can be so hard to get right. A custom builder needs to be part-therapist, part-priest, part-mistress to coax the needed information honestly out of the rider. For Ben, it goes way beyond what a rider weighs or how much power they put out, although those metrics are certainly part of the process. Ben wants to know about your favorite ride, and he wants to hear about your favorite bike and what you loved about it. Can you handle a bike? How much do you really ride? What do you really need out of a custom bike? It all goes into the Argonaut hopper to ensure a 145-pound climber who dishes out suffering on the club ride will not be on the same bike as a 180-pound, eight-hour century rider, even if they both happen to ride a 56cm and desire identical geometry. Every Argonaut is assembled in Bend, Oregon, from pieces molded at ICE. Since Ben has such control of the layup in each molded segment, he does not need to rely on overwrapping to create ride quality; each piece is just bonded to the other and then finished and painted in-house. The result is a frame with exceptional fit and finish—smooth walls, invisible joins, subtle tube shaping and, overall, a traditional look and feel. There is magic in a custom bike, one that fits like a glove and is tuned to your input both at the pedals and the bars. But the ability to spec a bike from the ground up, eliminating a product manager that makes choices based on price points and latest trends, is what truly makes a custom bike a dream bike. We started with SRAM eTap, simply the best way to move the chain across the cassette. But we mated that to a Rotor 2INPower dual-sided meter with ovalized Q-rings. We’re fans of Q-rings, and while SRAM does not recommend them for use with eTap, we’ve found the YAW front derailleur does an exceptional job of moving the chain across the rings. Zipp’s NSW 404 carbon clincher, with the new Cognition magnetic free-hub, was the first wheel choice, and we’ve fallen in love with ISM saddles. The PN1.0 sure looks strange, but ride it and it creates the happiest marriage between anatomy and bicycle we have ever ridden. Other little tweaks really made this a dream bike. We put a Muc-Off Nanotube Optimized Chain on it to save a few watts the easy way and sourced bars from Pure Outdoor with Lizard Skins 1.8mm DSP tape. These are bargain-basement, generic Chinese-made bars and, while plenty stiff and light, we cannot vouch for their durability; we just fell in love with the way the admittedly outlandishly shaped bars fit. Zipp Alumina cages, an ENVE post, Fi’zi:k stem and 28mm Panaracer Gravel Kings for long, hassle-free winter miles wrap the build up. Being one of the most recently built Argonaut custom bikes it also posses the new T47 bottom bracket. A joint venture with Chris King, it has the benefits of an oversize BB, while trading creaking, plastic, press-fit for deep, juicy titanium threads. No other rider would spec’ the bike exactly like this, which is fitting since no other rider will ever have the same bike. 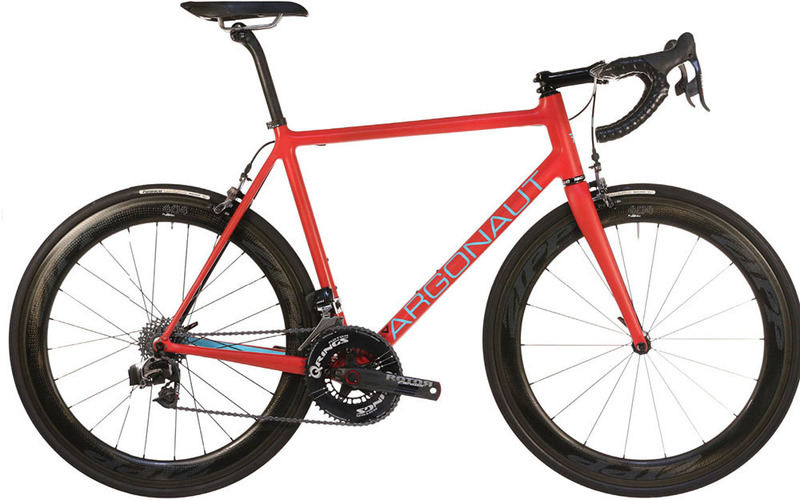 Our custom Argonaut weighs 7.4 kilograms (16.3 pounds) and in stock sizes would most closely align with a 58cm. In some ways, the ride of this bike is irrelevant. With the enormous flexibility Ben’s construction process gives him he can make a frame ride in an infinite number of ways. What is relevant is how close he came to delivering the ride quality we wanted and how it is expressed in a number of ways—both objectively like five-minute power numbers and subjectively with words like "kinetic" and "percussive." He hit the bull’s eye with our requests: an aggressive position with a tight rear end that can withstand fairly high wattage with ease and ramp up the pace on steep climbs with crisp power transfer, yet happily knock out a six-hour day across all manner of road surface. This is a pure road bike, no mixed surface here, yet 28mm tires fit comfortably. We’re OCD freaks when it comes to a bike’s front end. It must be stiff enough through the down tube-head tube top tube junction to confidently white-knuckle any level of ludicrous descending, yet still be able to flow with the rear end in balance to stick a line over a chattery final corner. Ben starts with an ENVE fork, a very good place to begin, but he’s placed it within one of the best front ends we have ever ridden. It reminds us of the Specialized Tarmac or BMC SLR01: pure confidence at breakneck speeds, with the nimble quality necessary to get you out of trouble at speed when that corner gets a bit too tight and a handful of front brake will only put you on the deck. Ben Farver and Argonaut have taken the ethos of custom and deposited it squarely on the cutting-edge of carbon manufacturing. And it’s safe to say that Ben possesses the skills to get you on the right bike, even if you aren’t sure what the right bike is. These frames are not cheap, but this is the state-of-the-art of custom bicycle building in the world today. PRICE/WEIGHT: $7,250 (frame, fork, saddle clamp) 7.4kg/16.3lbs approx. (58cm w/o pedals or cages). BUILD: SRAM Red eTap with Rotor 2IN Power cranks and Q-rings. Zipp 404 NSW carbon clinchers, ENVE seat post, fi’zi:k stem, Pure Outdoor bars, ISM PN1.0 saddle, Panaracer Gravelking tires.